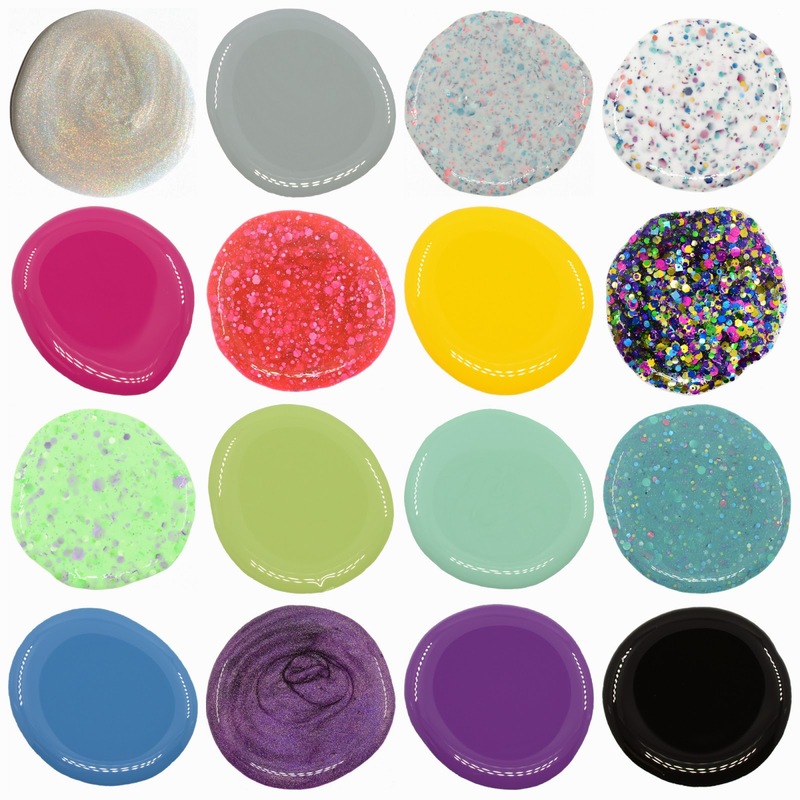 So last week, KBShimmer released her Spring 2014 collection. I quickly bought Quick & Flirty and Prism Break and they are already here! Talk about great customer service. Please enjoy the following release - all images courtesy of KBShimmer. For quick dry time and smooth feel, follow with KBShimmer Clearly On Top. Full Bloom Ahead This white based polish is loaded with small, medium and large hex glitters in fuchsia, navy, teal, gold and orange; colors reminiscent of those floral tones that signal spring is near. Best in 3 Coats. Belle Of The Mall This coral toned pink polish is a fun color to brighten your day. This jelly like polish is loaded with holographic silver hexes in various sizes and is stunner in the sun. Best layered in three coats, or worn over a coordinating cream. Rush Flower Traffic A metallic glitter top coat with fuchsia, gold, green, sapphire, and aqua glitters in hex and dot glitters fill this polish. Ideal as 1 coat over our Chick Me Out or Honeydew List creams, this topper can be worn over so many colors! Daisy About You A pale green creally, this spring polish features neon green hex glitters swimming among purple and lavender hexes and a scattering of lavender daisy glitters. Best in 3 Coats. Laugh Myself Lily A muted jade creally with holographic hexes in gold, pink, sliver, lavender and blue. Pink and light aqua dots complete this muted polish. To allow the glitters to shine this polish more sheer and is best layered in three coats. Quick and Flirty Every girl needs a good violet colored polish in their collection, and what better than one that comes with a rainbow! This linear holographic offers full coverage in 2 coats, add a third for a deep lilac color. Make My Gray A pale shade of gray sets off glitters in turquoise, gunmetal, pale aqua and coral. Wear alone in 3 coats, or layer this over a grey like My Life’s Porpoise for a unique spring manicure. Ideal for wearing alone, under glitter polish, or for nail art. For quick dry time, follow with KBShimmer Clearly On Top. Life Rose On This is my perfect pink, bright cheery, and it covers in 1-2 coats. This vivid cerise polish has blue undertones, making it wearable for many skin tones. Pair this with your favorite glitter topper or use in stamping for a girly manicure. Chick Me Out This bright yellow cream is the ideal shade to welcome warmer weather. Full coverage in two coats, I love this under Rush Flower Traffic. Honeydew List Just like ripe honeydew, this dusty pastel green is perfect for spring or summer. This is the ideal color to wear under Rush Flower Traffic, or pair with Ice Queen for a sparkly spring manicure. Full coverage in just 2 coats. A Touch Of Glass This light aqua mint cream reminds me of tumbled sea glass. A pastel green with blue undertones, this color is covers in 2-3 coats. Sky Jinks I love those days, the ones when there is not a cloud in site, and the sky is the most stunning shade of bright blue. This medium blue cream with a hint of dustiness, reminds me of those perfect days. Sky Kinks covers in 1 coat with careful application and is perfect in two. Pansy-Monium This pansy purple cream offers full coverage in just two coats. With a slight red undertone, this purple will look great even on warm skin tones. My Life’s Porpoise No matter if you spell it gray or grey, this pale shade is a neutral that is fun to wear alone, or under bright toppers like U Rock My Heart. This creamy shade covers fully in two coats. Eclipse Black is a fashion staple, not only in clothes, but on your nails! This is a true black cream, covering in 1-2 coats. KBShimmer products can be found at http://www.KBShimmer.com. For sales outside of the US visit http://www.HarlowandCo.org.